Read more about Recent graduate making mark! A $1.2 million grant from the Department of Defense was awarded to Geoff Wright, PhD (PI), together with colleagues Carole Tucker, PT, PhD and Emily Keshner, PT, EdD, the College of Public Health’s Department of Physical Therapy, and Ryan Tierney PhD, ATC from the Department of Kinesiology. This study will investigate chronic symptoms of traumatic brain injury (TBI) using an innovative new virtual reality-based balance assessment device they designed. Going to CSM? Join us for the Temple Reception! Read more about Going to CSM? Join us for the Temple Reception! Temple University, designated a Carnegie Research Universities (high research activity) institution, is a comprehensive public university located in Philadelphia, PA. The campus is racially and ethnically diverse, with more than 39,000 students. Temple DPT students and faculty conquer the MS Ride over the weekend! 80-100 miles! They also raised over $2000 to support the MS society! Temple DPT students John Mikus '14, Chris Lucas '14, Kayla Conforti '14, Nadia Wyrsta '14, Anne Galgon [faculty] and Cameron Hui '14 were out enjoying the beautiful weather and training for the upcoming MS ride! New continuing education opportunities available - register fast, space is limited. Congratulations to Temple first year DPT student for being selected as a Temple Trustee Ten Student-athlete recognizing the Top 10 student-athletes at Temple in terms of GPA. 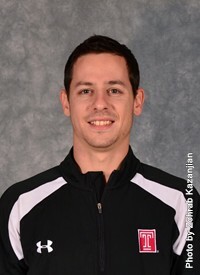 Assaf competes for the Temple Men's Gymnastics Team!